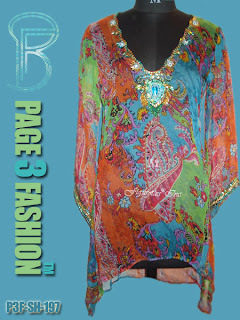 A multi color paisley pattern beach wear outfit has amazing fall, asymmetrical hem, V neck and long sleeves with lovely embroidery. This is a fabulous beach wear specially designed focusing beach and resort. •	Prepared from Viscose Chiffon fabric. •	Enticing embroidery work of fine beads and sequins. •	Contemporary and comfortable design for any beach and resort.